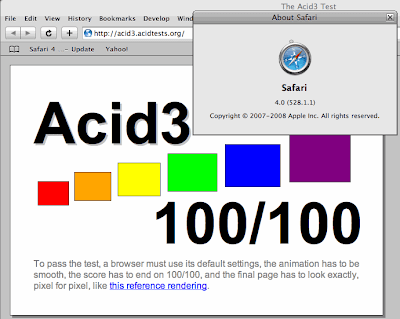 Safari 4 Developer Preview - Update! Apple’s Developers Connections Apple released a new seed of Safari 4.0 Developer Preview Version 4.0 (5528.1) for Leopard, Tiger and Windows. 1) CSS support for masks, gradients, reflections, and specifying a named canvas. 2) Rudimentary support for the WAI-ARIA (Rich Internet Application) and cross-site XMLHttpRequest specifications. 3) Ability to send messages between documents. 4) Storage of data either locally or just for the user’s session. 5) Option of running web applications outside of a browser or when disconnected from the network. This preview release is English only. Please include "Safari 4 Developer Preview" in any feedback. Windows users should uninstall any old versions of Safari before installing.